Up in Massachusetts There’s a little spit of land. The men who make the maps, yes, they call the place Cape Ann. But the women left behind, they call the place Dogtown. Welcome to our Dog & Rocket blog which will cover the 5 weeks of our trip this year to North America. Our itinerary takes us via Hawaii to Massachusetts, Niagara Falls, New York, Virginia, Washington DC, Charleston SC and Flagler Beach FL, Cape Canaveral FL, before returning to OZ va Hawaii. 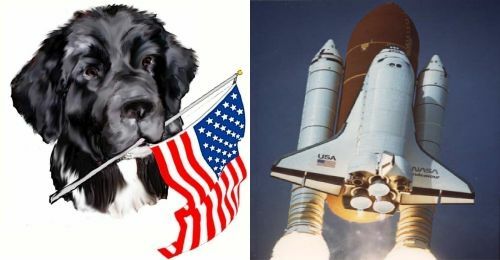 So you are probably asking yourself why the name of “Dog and Rocket” and here follows a brief and hopefully coherent explanation. So our tour begins in Gloucester Harbor, Mass the old whaling town that Harry featured in his song “Dogtown”. We have never been to that part of the USA, so this was a good reason to include it on our itinerary and also to see Niagara and New York, two other places we have yet to visit. We finish our tour in Flagler Beach, FL where we will be handily placed to see on July 29 +/- Mission: STS-134 Launch Vehicle: Space Shuttle Endeavour Launch Site: Kennedy Space Center – Launch Pad 39A Launch Time: 7:51 a.m. EDT. This will be our second attempt in recent years to see a Shuttle launch and hopefully it will go off on schedule. This is the penultimate launch of the Space Shuttle before it is retired so we hope it all goes as planned.